I’m taking advantage of the long weekend. My eldest brother may be 50 but he still loves his ice cream. So as a gift, I have decided to make him six, homemade flavors within this year. Sadly, I’m falling slight behind. So this weekend, I am making up for lost time and churning up a double feature. Each of these flavors that I made emulates ice creams that I currently love. I’m looking to recreate a Sebastian’s favorite of mine. Using David Lebovitz’s recipe as a jumping off point, the first flavor is a sweet White Chocolate Ice Cream with Roasted Macadamia Nuts or better known as a Macadamia White. Prepare two mixing bowls. In one bowl, place the white chocolate and put a strainer over that bowl. In the other, whisk together the egg yolks. In a saucepan, mix together the milk, sugar and salt over medium heat. Slowly pour the warm milk over egg yolks, constantly stirring. Once full combined, pour the egg-milk mixture back into the saucepan. Place the saucepan over medium heat. Stir the mixture constantly with a wooden spoon. Once the mixture thickens and easily coats the spoon, pour it through the strainer into the white chocolate chunks. Combine the custard, white chocolate and the cream until smooth. Place the bowl in an ice bath and slowly stir until cool. Chill the mixture in refrigerator overnight. Freeze it in your ice cream maker according to the manufacturer’s instructions. A few minutes before the end of the churning, slowly add the crushed macadamia nuts. Store the new churned ice cream overnight before serving. The second flavor is inspired by Selecta’s Gold Label line of ice cream. I’m making a Chocolate Hazelnut Ice Cream made even with more decadent with the addition of crumbled bits of Fudge Brownie. In a large saucepan, mix together the milk, cream, cocoa powder, sugar and salt over medium heat. Once the mixture comes to a boil, remove the pan from the heat. Whisk in the hazelnut spread until thoroughly blended. Chill the mixture in refrigerator overnight. Freeze it in your ice cream maker according to the manufacturer’s instructions. During the last few minutes of the churning, slowly add the cubes of fudge brownies. Am flattered that you'd recreate our flavor :) That Macadamia White looks awesome! wow! those flavors look delicious! Your brother is so lucky! Wish someone would make me ice cream on my birthday too! By the way, do you have a recipe for avocado ice cream like what they sell on the streets in Manila? ice cream!!! :) grabe franco you're really talented! 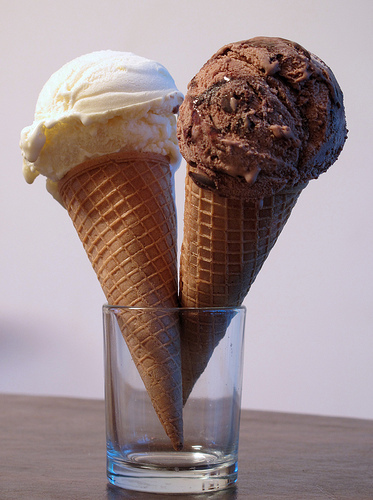 :) would love to try your ice cream creation! looks so yummy! !